Incoming Yardage to date: 52 yds. Outgoing Yardage to date: 48.25 yds. Total Stash Busted to date: – 3.75 yds. I don’t have the last 8 star blocks sewn together yet, for the Gracie’s Star, but I do have the pieces all cut out, so I’m going to mark that fabric as busted. 12.5 yds out this week. I still haven’t decided if they are going together in the original pattern, or if I will separate them into two different quilts. We’ll see. I was hoping to make more quilting progress on my 9P & stripe quilt, and, had I not screwed up on the swag quilting, I would have. Somehow, I got off center with it, and didn’t catch it til I had almost the whole border of it stitched. I got to the right bottom corner and I was not ending in the right position. And way too much off to fudge a bit. So, any significant time spent on that this weekend was frogging. Yuk. 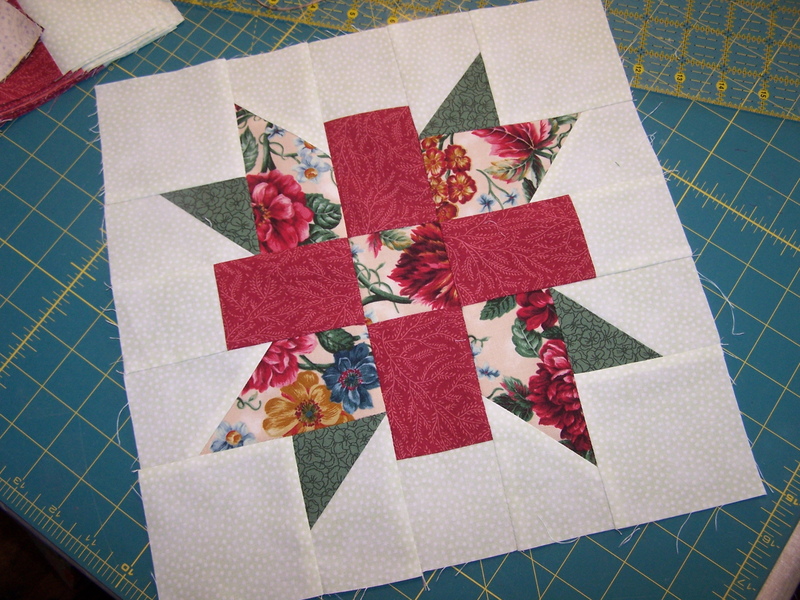 But I got it done, and now I can get back to quilting, when I can find some more time. Today, I did pieced four more Gracie’s blocks, and put together a block from the final instructions for the mystery quilt I’m making. Hmmm…I’m not in love with it, but oh well. Not sure what I’ll end up doing with these blocks, either. I’m still trying to knit a sweater, too. I’m really anxious to try my hand at socks, but no better than I seem to be doing at a basic stockinette stitch sweater, I should probably hold off a bit. In the meantime, if you like knitting, then stop by Maria’s blog. You will be in for a treat. Click on her finished projects tabs at the top of the page. And don’t worry, there’s some pretty quilting eye candy in there, too. Except for a poncho, I had not knit in 10 or more years. Sock knitting, however, is addictive. I’m slow at it, but mesmerized. And stockinette stitch is even easier on socks… all you do is knit! Aw, thanks! When I started quilting, I did it because I loved quilts but didn’t enjoy the process. How that has changed! Knitting is probably the same way. I started knitting in 8th grade and I was too naive to think it should be hard. I’ve just always loved to knit.